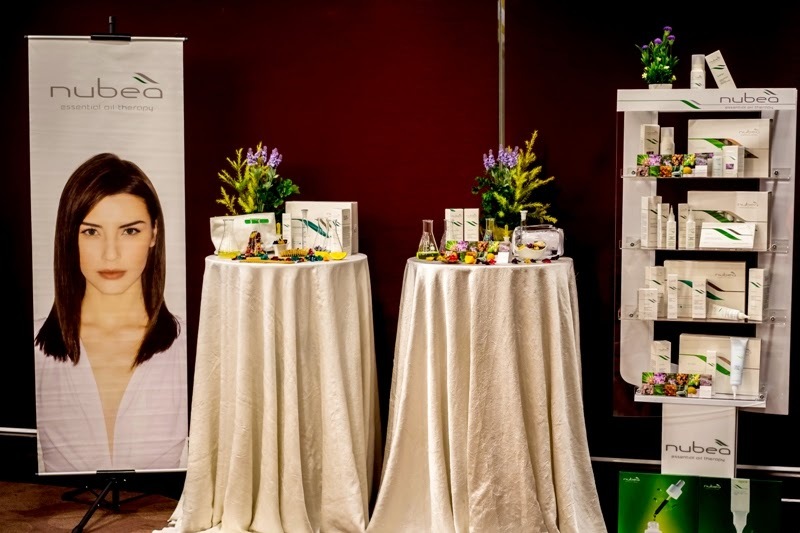 New Nubea haircare from Italy is now is now available in Malaysia. Inspired by nature, balance and technology; Nubea natural and free-of-chemicals essential oil therapy, capable of restoring the health of our crowning glory, so that resplendent and healthy hair is possible. The secret of Nubea formula is the synergy of essential oils and plant extracts, both elements represent the highest peak in the biological evolution of plants and contain the highest medicinal and curative properties. The scalp is considered the best channel for using essential oils and getting to the root of hair treatment. Essential oils such as Rosemary (Rosmarinus Officinalis) promote cell regeneration, and are ideal for dry hair and help to stop hair loss. Lavender (Lavandula Angustifolia) has a calming and soothing effect, and it regulates sebaceous secretions which is suitable for normal and greasy hair. Tea Tree (Melaleuca Alternifolia) is anti-inflammatory and anti-bacterial. Sage (Salvia Officinalis) is a stimulant that helps reduce hair loss. Eucalyptus (Eucalyptus Globulus) is stimulating, astringent, analgesic and healing, suitable for treating inflammations of the skin caused by bacteria and fungi. Nubea Essential Oils hair therapy are enriched with Plant Extracts, Trace Elements, Vitamins and active ingredients that are proven to be effective. The plant extracts include Arnica Extract, Serenoa Extract, Malva Extract, Algae Extract, Calendula Extract and Ginseng Extract. 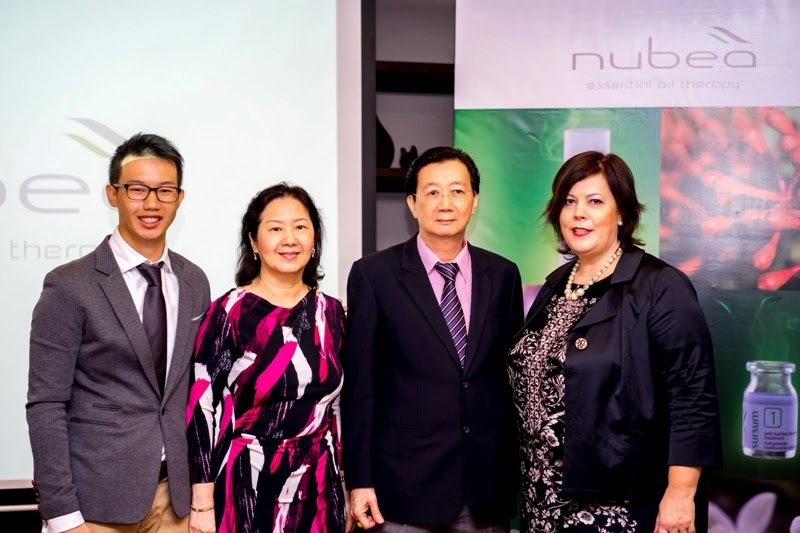 Strengthening the efficacy of Nubeà formula are active ingredients such as Azulene (distilled from chamomile), Bisabolol (distilled from Candeia Tree), Hops (distilled from Humulus Lupulus), Climbazole (topical antifungal agent), Piroctore Olamine (anti-dandruff agent), and Vitamin A and E.
Nubea hair treatment products are formulated to achieve detoxification and stimulation necessary for growth of healthy hair, through the application of a precious mix of essential oils, which allows the scalp to regain its perfect balance owing to the important nutrients it receives that are necessary for the synthesis of keratin to occur. There are 7 ranges of Nubea products. They are Essentia, Sursum, Solutia, Equisebo, Auxilia, Synergo and Solenium. These ranges specialize in detoxifying, anti-hairloss, anti-dandruff, anti-sebum, sensitive scalp, synergic differential treatment (maintenance treatment) and sun care respectively. Essentia - Detoxifying Treatment: consists of shampoo, Pure Extract, pre-shampoo detoxifying treatment vial and post-shampoo detoxifying Treatment vial. It contains essential oils of Scots Pine (Pinus Sylvestris), Sage (Salvia Officinalis) and Rosemary (Rosmarinus Officinalis). Sursum - Anti-hairloss Treatment: the rare extract of Saw Palmetto (Serenoa Repens) is one of the main agents that prevent progressive hairloss. The formula also includes essential oils based on Lemon (Citrus Limonum), Bergamot Orange (Citrus Aurantium Bergamia) and Vitamin A and E. The vitamins help with vitality of hair and visibly maintain growth as prerogative. This treatment comes in treatment vial, shampoo, daily lotion and patch for localized and topical application. Solutia - Anti-dandruff Treatment: this treatment is formulated to prevent both greasy & dry dandruff formation, calm itching, sooth the scalp and leave the hair soft and moisturized. It contains Tea Tree (Melaleuca Alternifolia) (antifungal), Chamomile Eugenia (Chamomilla Inacutita) (calming) and Rosemary (Rosmarinum Officinalis) (toning) Essential Oils. The treatment consists of a purifying extract, a purifying emulsion, and an anti-dandruff treatment vial, daily lotion and shampoo for dry dandruff or greasy dandruff. Equisebo - Anti-Sebum Treatment: this treatment regulates the production and secretion of sebum, purifies the scalp and restores volume and lightness to the hair. It contains essential oils and trace elements such as Scots Pine (Pinus Sylvestris) (stimulating), Cloves (Eugenia Caryophyllata) (antisepting) and Sage (Salvia Officinalis) (anti-inflammatory). The product ranges in this treatment include treatment vial, shampoo and daily lotion. Auxilia - Sensitive Scalp Treatment: the shampoo, treatment vial and daily lotion for this hair treatment ensures skin relaxation, gives a pleasant feeling of well-being and helps to restore the hydro-lipid film for sensitive scalp. The active ingredients include Lavender (Lavandula Angustifolia) (anti-inflammatory), Mint (Menta Arvensis) (healing) and Aloe Vera (regenerating). Synergo - Maintenance and Balance: this range of products is formulated to maintain the state of good health after a specific course of treatment. This is essential to avoid hair problem from recurring. The synergic differential treatment includes active ingredients such as Lavender (Lavandula Angustifolia) (anti-inflammatory), Common Lime (Tilia Vulgaris) (calming) and Blue Gum (Eucalyptus globulus) (decongestant). It consists of shampoo and hair mask. Solenium - Suncare Treatment: with selenium products, containing precious Essential Oils, plant extracts, trace elements and vitamins, you can continue to enjoy healthy, protected scalp and hair even under the sun. The range of products includes after-sun nourishing shampoo, revitalizing hair/body shower gel with anti-salt and anti-chlorine action, after-sun nourishing hair mask and protective spray-on to protect hair from the harmful effect of the sun, and to protect hair color as well as giving hair softness and shine without weighing it down. Nubea hair treatment products are retailed at RM88.00 to RM328.00. 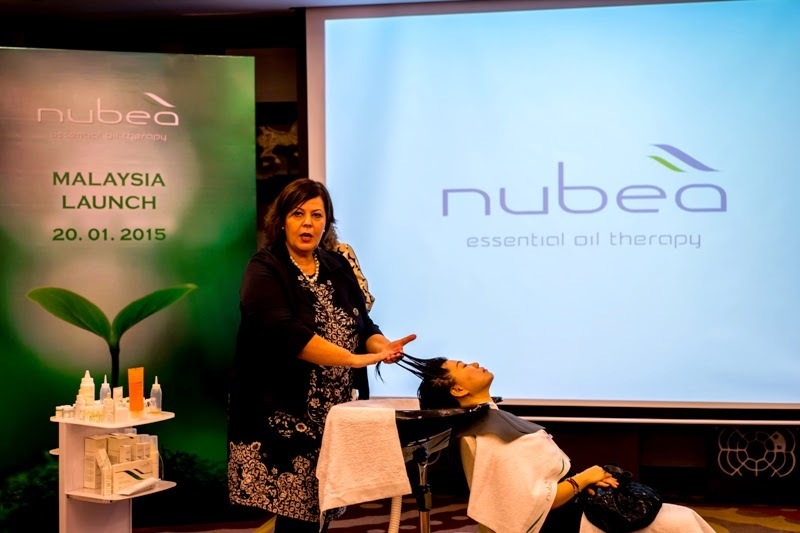 Nubea haircare is available at www.rakuten.com.my and selected beauty salons in Malaysia.